It’s hard to recommend something as grand or on as big a scale as Route 50. It has been affectionately labelled the backbone of America, stretching as it does from coast to coast. The road is the waistline of Northern America and cuts across the middle of the country perfectly. It isn’t any one specific point of the road that is of particular interest, instead it’s the journey as a whole and the experience of making the pilgrimage from coast to coast. It isn’t about the destination so much as it is about the journey. The road itself is just over 3,000 miles long, starting in West Sacramento, California, and ending in Ocean City, Maryland. It passes through 12 different states as you travel along its length and the section through Nevada is known as “The Loneliest Road in America.” Route 50 mostly runs through rural areas and desolate landscapes but it does pass through a few major cities too, most notably Kansas City, St. Louis, and Cincinnati. The route offers a compelling and eye-opening view into the heart of America, and the cross section it provides of the nation is such a fascination that the July 7th, 1997, issue of Time Magazine focused on Route 50 almost exclusively. It is believed that the road owes its existence to Captain William Bicknell, who successfully made the exhausting trip to Santa Fe, where he sold his various goods and services, making a fortune in the process. After word of this got around, the Santa Fe Trail was blazed. Later on railroads followed the trail and these paved the way for Route 50 itself. Although Route 50 does alight in some major cities, it mostly ploughs through the middle of rural America, allowing you to experience Small Town USA in an immersive way. Take a little time in each place you visit as remnants of the country's history can still be spotted amongst the newer buildings, a small glimpse into a time gone past. 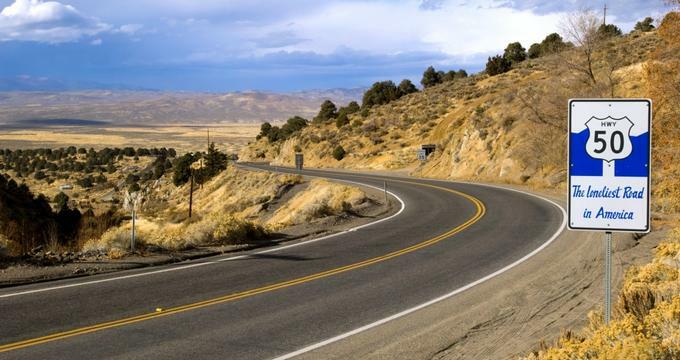 The Nevada section of Route 50, or “The Loneliest Road in America,” is a straight road that seems to head into nowhere. The road takes its name from the fact that you can travel down this section of US 50 and not see another living soul for hours and hours. The landscape is bleak and quiet, with only the sky, the ground, and the occasional mountain to keep you company. It is so easy to slip into reverie or soul searching out here, and there is something about this section of road that is both therapeutic and restorative and simultaneously terrifying. Whether you use it to get from place to place or, as recommended, you take the scenic Route 50 across the USA, you are sure to enjoy a wealth of history and heritage along this road. It will take you to places that you never knew existed and it asks and answers questions you never thought to ask. Buckle up and sit back and take this sometimes bumpy drive across the backbone of America.